The below drop list will cover items dropped by Baphomet, and will focus more on Rank 4 Purple Items since they are the most used or sold items in the game. 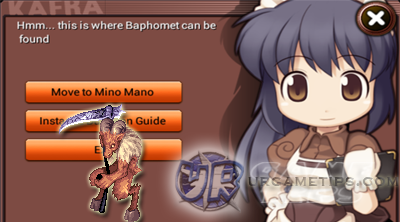 Baphomet is far stronger than most usual monsters outside dungeons and might require a good party to easily defeat this monster, but once defeated, valuable items may be looted from it. Refer below for more information. Jitte: Lvl: 40 (Dagger) Equip: Thief Class NEW! Various Jur: Lvl: 34 (Katar) Equip: Thief Class NEW!